When it comes to inbound marketing, no one does it better than HubSpot. (Editor’s note: Hey, we’re trying too! :) Let’s face it: The company raises the bar on content marketing, including webinars, ebooks, white papers, case studies…you name it, they do it (more than anyone). The great thing about HubSpot isn’t necessarily its inbound marketing prowess, but it’s willingness to share the company’s expertise with its audience. Therein lies the key to inbound marketing. 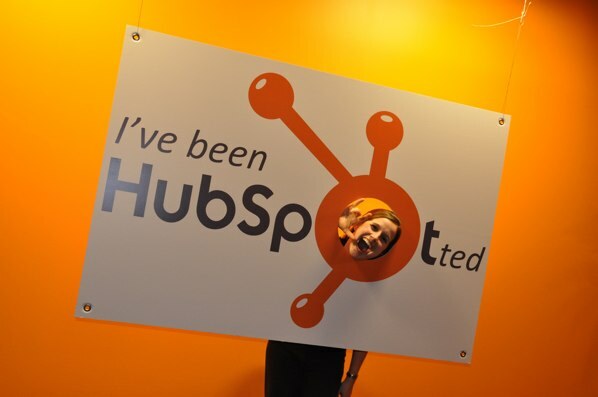 Here’s how HubSpot gets it done. 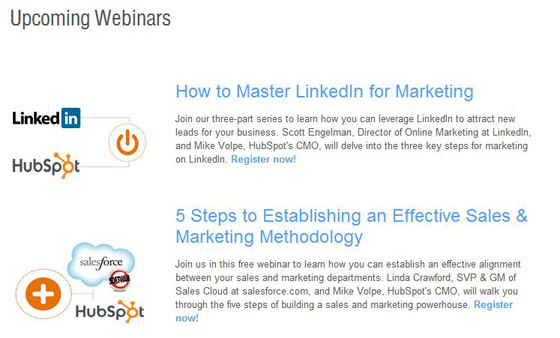 Webinars are a widely-touted way to bring in inbound links and showcase your expertise — especially if they’re free. 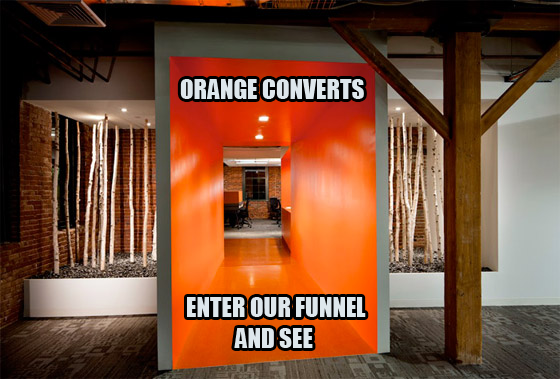 And that’s exactly how HubSpot does it. They offer free webinars hosted by experts — not all from within the ranks of HubSpot itself — to educate their audience on various marketing components. But it’s not always easy to draw an audience to a free webinar if you don’t have the industry klout and connections to make it happen. That’s why partnering with widely known industry experts can be just the ticket to get noticed. So if you’re not adept at a popular topic, tap into your network and secure a guest speaker who knows her stuff. Her own connections can be just the boost you need to drive up attendance. HubSpot makes use of webinars to collect inbound leads, making use of outside experts to capitalize on their audiences and expertise. HubSpot wasn’t messing around when the company hired Dan Zarrella, the author of three books and self-proclaimed “Social Media Scientist”. Zarella boasts registrations of 30,000-plus for his own webinars, let alone his current World Record for the most webinar registrants ever. Marshall Kirkpatrick of ReadWriteWeb sums it up: “Zarrella calls himself ‘The Social Media and Viral Marketing Scientist’ and is one of the few people on the web with the credentials to back up such a bold claim.” HubSpot literally can’t go wrong hiring the likes of such a Web genius. Laura Fitton is another great example of smart hiring; Credited with convincing Guy Kawasaki and thousands of tech execs that Twitter would have real business value, author of “Twitter for Dummies”, founder of oneforty.com, popular keynote speaker, she is one seriously respected Inbound Marketing Evangelist. Hiring industry thought-leaders, like the widely recognized, published author Dan Zarrella, is a smart move for any leading marketing or tech company. 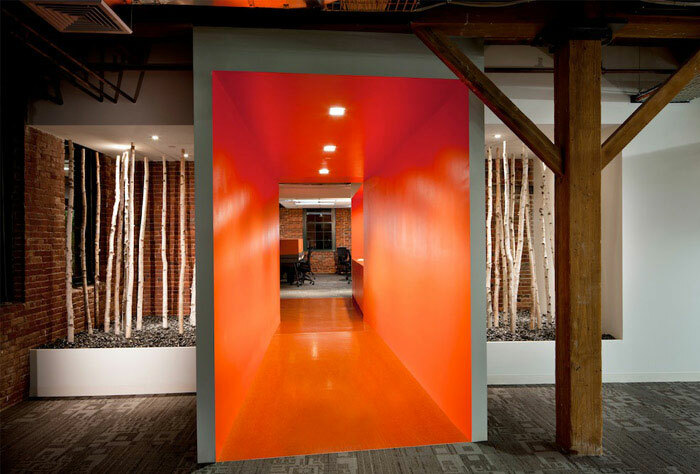 HubSpot’s claim to fame in inbound marketing is the use of content to drive inbound lead generation. Of course, it takes quite a bit of gusto and resources to put out the amount of content these folks do on a regular basis, but the efforts pay off handsomely. Several times each week, my inbox is blessed as the recipient of one of HubSpot’s latest and greatest content marketing pieces. Anyone can do this. If you’re a business owner or an expert in something — anything — pour your heart out onto your favorite word-processing software. Do some research and dig deeper into areas you thought were out of reach. Offer your customers something they can’t find anywhere else, and you’ll easily accumulate leads. Case studies — real-life stories of successful customers — are one of the most convincing forms of social proof. HubSpot uses email marketing brilliantly, capturing email addresses with every ebook or white paper download. Subscribers are organized by interest, and the company is able to track which customers interact with which messages, allowing them to follow up with targeted, relevant offers. Email marketing is easy to do, and there are dozens of different email marketing platforms that make it easy to both capture emails and plan autoresponder campaigns that will ensure your prospects never forget about you. The key to successful email marketing, however, is to follow HubSpot’s lead: Don’t overwhelm subscribers with constant sales messages, but do stay in touch regularly and send highly relevant information. I get emails from HubSpot at least once per week, often more. But I don’t mind at all. Why? Because most of the time, they’re sending me an informative piece of content that can help me improve the way I do business. Why would I complain about getting valuable resources, for free? Because I’m not being sold to, and I don’t feel like my inbox is being cluttered with irrelevant messages I don’t care about, I’m going to remain a subscriber. Emails from HubSpot immediately draw your attention because the subject line usually says something like, “Free eBook” followed by the title of the publication. When I open the email, I’m presented with a nice bulleted list of the information I’ll learn by downloading the ebook, and when I click to download it, I’m taken to — you guessed it — a landing page with a form to capture my email address and other information. And in case I wasn’t convinced before I clicked, a more detailed description is provided along with “What You’ll Learn” bullet points that will secure the conversion. 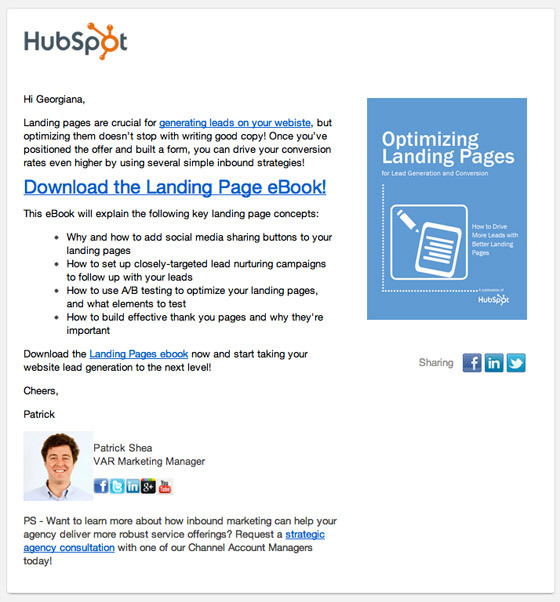 HubSpot uses email marketing to drive inbound leads. But they don’t sell; they educate. That’s the key to building an email list and keeping subscribers engaged. It doesn’t matter where you find yourself landing on HubSpot’s vast website, if you’re looking to download content or get in touch with the company, you’ll encounter a landing page. That’s because HubSpot plays it smart, capitalizing on each and every opportunity to generate an inbound lead by accompanying every single form with its own landing page, touting the benefits of the company’s products and services. 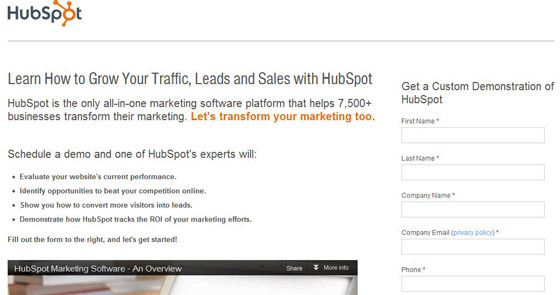 HubSpot makes a point to us a landing page for every lead gen form. In other words, if you weren’t convinced before you converted by clicking on the call to action, the landing page will do the job to convince you to hand over your name and email address. There’s one HubSpot strategy left to discuss, and that’s the company’s delicate balancing act between utilizing high-conversion landing pages and generating high-quality leads. Think about it this way: Would you rather earn 10 conversions that may or may not turn into paying customers, or earn 10 leads that will more than likely result in high-value, lifetime clients? For every business, not just HubSpot, this is a tradeoff to consider. There’s a fine line between gauging your landing page content to attract anyone and everyone (including those tire-kickers you know won’t ever hand over their hard-earned cash) and generating fewer leads with a greater lifetime customer value. If you’re looking to generate inbound leads like the experts, the first thing you should do is ramp up your content marketing efforts – i.e. start writing. Just try to make sure you’re giving out your content to the right people. Doing some landing-page testing to identify the types of lead gen form questions that will attract your true potential customers is a good place to start.